If you are living close to Epsom, residential and private care home for the elderly will not be very difficult to find. 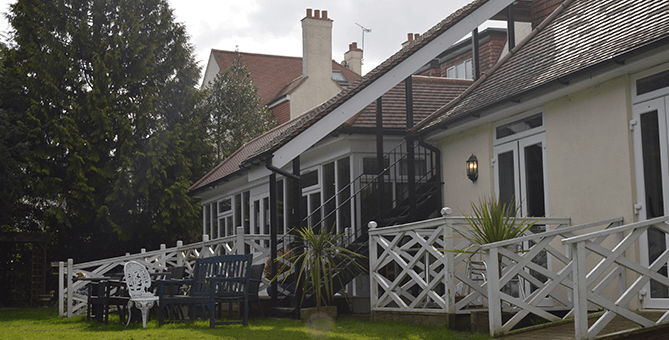 St Judes Nursing and Residential Care Home is a well established and convenient Epsom residential and private care home, located at one of the most peaceful and serene environments that one can ever find in the area. St Jude's residential and private care home is located at an approximately 4 miles distance Epsom, making it convenient to reach there for people in Epsom. Residential and private homes require well equipped staff and a homely environment for the elderly to thrive and enjoy a comfortable old age. At St Judes Nursing Home, we provide all these and many more. Our Dementia Care: We are specialised in Dementia Care for the elderly. Dementia can cause much distress to the elderly especially if they are left alone and uncared. Dementia causes partial memory impairment leading to much confusion among the elders. We have an intense goal to treat elders with Dementia with a positive approach. The elderly have some memory that remains with the. We use this memory to channelize it and support with our treatment to help them remain as independent and lead a comfortable life as long as they live and thrive. According to our believes enabling the elderly with Dementia living around Epsom, residential and private care home such as ours helps them to lead a comfortable and enjoyable life without any frustrations. We care deeply of for our resident's environment and their families too. Visitors and family members are heard and their requirements are given importance. There are several this things to look for when choosing an Epsom residential and private care home. The convenience of being so close to Epsom is known but why should they choose St. Judes for the convenient option of a residential and private care home beyond others? Dementia care is one of those reasons, but our facilities provide the perfect environment where the elderly residents can create their entourage with others like themselves. Well-furnishes and renovated rooms keeping in mind the taste and preferences of the elderly residents. Housekeeping services that are intended to provide the most clean and pleasant environment for our residents. We have a wonderful back garden where the elderly can practice their outdoor quests. Our IT systems enable the residents to use a convenient access to the Internet every day. Beyond the everyday social activities, we encourage our residents to participate in our sing a longs and movie watching at the cinema room or the bingo games. The food is made to be nutritious as well as palatable for your residents according to their preferences. We prioritize the care of the residents according to their dependency levels ensuring that the higher dependency residents never go untreated. We believe in personalising the complete daily schedule for each of our resident based on their medical as well as personal history so that they can experience the comfort of a home and the complete care of the professionals.